Kayzo‘s music does anything but blend into the current output from the electronic music scene. 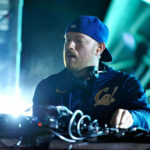 This is thanks to his eclectic fusion of screamo, punk rock, and heavy-hitting electronic notes into unique productions that continue to stand out as a fresh take on electronic music and pop. He’s maintained originality all through his comeup, placing himself as a particularly unique talent within the current crossover pool. The LA-based producer is known for keeping the energy high during his live sets, which makes his music perfect to start off a Saturday night with. We’ve chosen his Electric Zoo set from this past fall for this edition of Saturday Night Sessions; it takes listeners through a hectic, but pleasing journey that floats between bringing back pop punk tracks that graced airwaves 10 years ago and steep dubstep drops. Of course, he adds plenty of his own work into the mix. For those who reminisce back to the days of Papa Roach, The Killers, or even early Skrillex releases, Kayzo is an artist to follow — so get started with this savage hour-long mix.